October has overall been a good month and this week has been a good week. I have a few reasons to be cheerful this week the first being yesterday. I turned 27 and had a wonderful day. I saw a friend who treated me to lunch and a Costa plus brought along balloons and her little ones gave me some lovely cards. 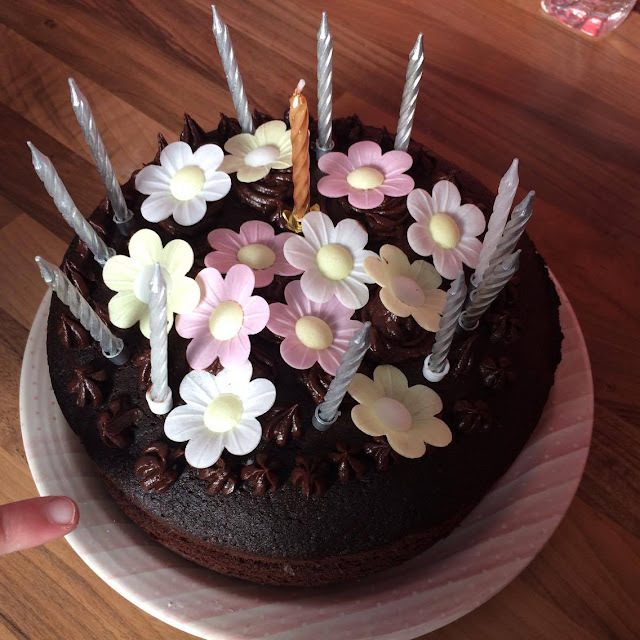 I saw family who popped in and my Mum came over who made a wonderful chocolate cake for me and which the children decorated beautifully. I've had some lovely gifts and surprise mail, I'll blog about my birthday properly next week but I had such a nice day it is most definitely a reason to smile! We've had a really good half even though we haven't done much. 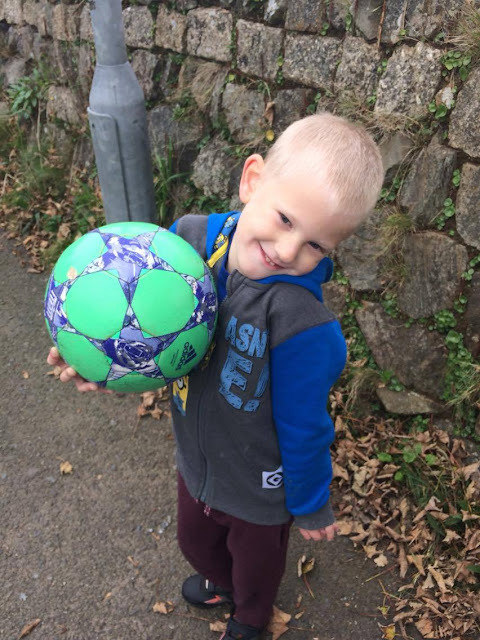 At the beginning of half term I felt awful for not being able to treat the kids to any days out because our purse strings are simply pulled too tight. I know you don't need day trips or holidays to make a good half term but sometimes it gets you down. 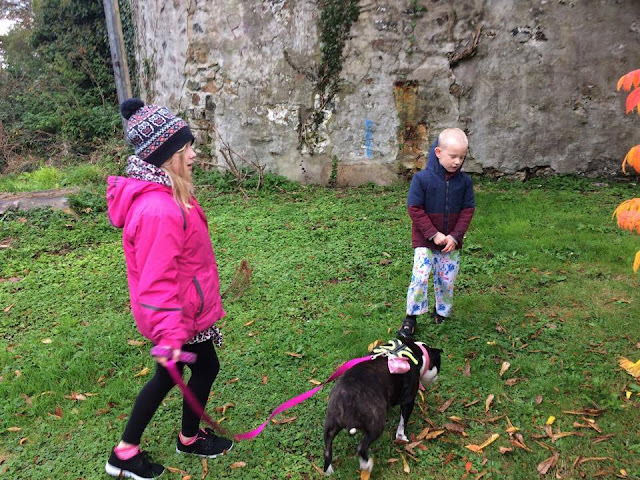 We've taken pleasure in the simple things like enjoying friends, going to the park, playing football, seeing family and Midge even slept over her Aunties house with all her cousins which is a huge step for her, I was very proud. We've had movie day at home, celebrated my birthday, bought toys from the pound shop and taken pleasure in each others company. Mr B is finally getting a holiday from work; he is off until next Friday and I'm looking forward to spending some time with him. Although we have the back to school routine, he'll enjoy getting to see the children properly and I'm sure he has some plans of his own! I hope you've all had some reasons to be cheerful this week too. Survey! What Do Parents Do To Unwind Around the Home? 3) Has Brexit actually affected your spending habits around the home and garden? For me, unwinding is about taking the opportunity to do whatever I want to do and usually whatever I most feel like doing at the time. Sometimes it's my blogging, sometimes I like to catch up with my pen friends and write lots of lovely things. Sometimes I like to go hunting around the charity shops for bargains or take a simple walk either alone or with someone else. Mostly my unwinding comes in the form of a newspaper and a hot chocolate in my local Costa (surprise surprise). As for Christmas, Mum and I have big plans this year. I love Christmas. I plan to decorate early as always and go shopping for stocking fillers in the local shops. On Christmas Eve Mr B is working but he'll be home for Father Christmas duty and footprint making. On Christmas Day we're heading to my Mum and Dads for a big family Christmas which we haven't done in years. It's going to be really special and we're looking forward to it so much. It also means I won't need to do a Christmas food shop this year! Ah and Brexit. Has it stopped my spending around the home and garden? Well, something has but I'm not so sure it's down to Brexit. I've never been a big spender on the home and garden but then I have truly never had the money to buy a lot of things, most of our items come second hand or through a catalogue site. It's quite an interesting survey and I'm looking forward to seeing the results when they are all revealed! Yep, another half term has slowly crept upon us. I do love spending the time with my children, love that they get a break from all that homework and that we can enjoy some lay ins and lazy days. I like to get out every day with my 2, even if it's just walking the dog like it was today but I do wish we could do so much more sometimes. I've been reading through the booklets that have come home from school in the book bags and some blogs online about what to do this half term in your area and it's had a real effect on me. Money is super tight these days; like it is for a lot of us. I don't have enough to save for every half term as well as pay all my bills and get Christmas sorted (no matter how budget friendly I'm being this year!) It's just not there. It isn't that all of these places are stupidly overpriced (some are though..) but even a reasonable cost soon turns far too much for us when you have to add up everyone else plus travel. 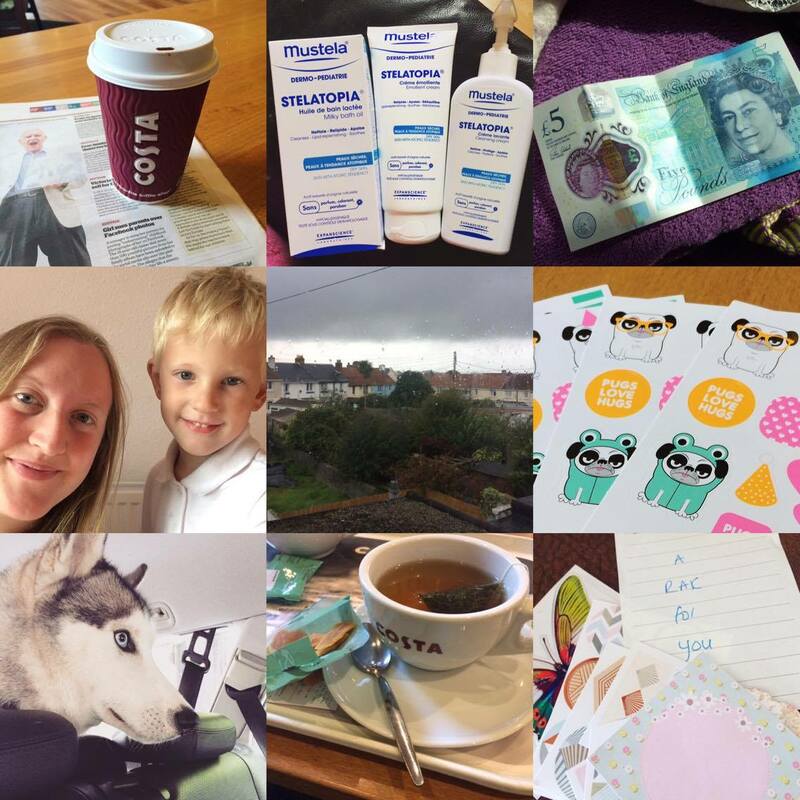 So, I've decided to write this post for all those who are struggling with the pennies this half term and can only afford super cheap or free activities to do and places to go. These places are in Cornwall but if you have some free time to do some Google searching, I'm sure you will find something too. Head down to your local library and find some Halloween themed books. Find books on witches and wizards, children's books or slightly older books like famous Harry Potter and have a little read together in your own little circle. Some local libraries hold half term events or activities too. With many supermarkets selling a pumpkin for £1, this is a fun and cheap activity for the family. 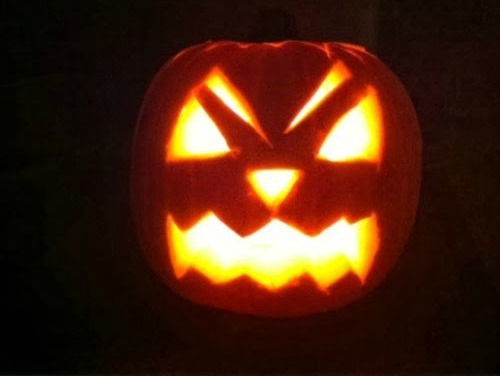 Using a pen to draw a spooky face on your pumpkin then a kitchen knife for the carving and (if you're like me) your bare hands for the 'gutting' you'll have a spooky pumpkin for you all to enjoy. Why not light it up or place false tea lights from Poundland in it, switch off the lights and admire your veggie friend!? You could grab some popcorn from your local pound store or make your own with kernels from Tesco for £1.90 and sit together to watch a film. We've so far watched Minions and Rio this half term but to get into the Halloween spirit Hocus Pocus is on my watch list! You don't even need popcorn, just a duvet and someone to snuggle with. Totally free of charge in most places unless you want to buy food from a woodland cafe or you're joining a specific event/activity there is no need to spend the pennies. Enjoy the leaves under foot, walk your dog, spot some wildlife and have fun! Have a craft day making autumnal pictures, leaf rubbing, collecting fallen leaves and conkers. Play around with paints to make an autumn themed picture or make a collage out of the leaves you've collected. Paradise Park are holding a disco again this year in their Jungle Barn. As it has a separate entrance I'm sure you'd enter there and pay to attend the party at the reception of the play barn. For under 3's the party is free, over 3's are £5 and adults are £3.99 Enjoy a disco, fancy dress, prizes and pumpkin soup! If you can get to Bodmin on the 29th and 30th October there is Bodmin and Wenford railway which has a half price event on; so adults will be £6.50, Seniors £6.00 and children FREE! I really love trains and have yet to experience this day out but I think if you can afford it, it would be fun! Trains are running from Bodmin General Station at 10.50, 12.10, 13.35, 14.45 and 15.50. I've found a Godolphin Cross village trail to hunt for pumpkins. You hunt for pumpkins around the village on 29th October starting at the Chapel from 6pm. Pick up a map for £1 and enjoy the fun! There will be refreshments available all evening too! If you're in Newquay on October 29th there's a family friendly event from 1.30pm! Children of Newquay are invited to join the free Zombie Crawl; a fun Halloween event dressing up all gory and walking the parade full of Halloween spirit! Children aged 5 to 16 are encouraged to join in the spooky fun, which will start with Titan the Robot at 1.30pm on Newquay's Piazza opposite the Lighthouse Cinema. There will be face painting in Whiskers coffee bar and at 3pm the parade will begin, along Bank Street and East Street. The parade will finish at the Hotel Victoria for more ghastly goings-on; another visit from Titan the Robot at 4.45pm, more dance and live entertainers, plus you can have your photo taken in the creepy, but very cool campervan photo-booth. The Hotel Victoria will also be hosting a children's disco after the final Titan show. This sounds awesome and I'd totally be going if I lived in Newquay! Those are a few ideas I've managed to find. For some people (like myself) these ideas may not be manageable for various reasons but I still hope you can do the at-home and out and about activities that we will be doing. If you know of any free activities or places with free or cheap admission or want to add an at-home half term idea then please do leave me a comment below! It seems strange that we've sped through another month and September feels so very long ago! I really can't remember it very well. It didn't start off great with the notice being given on our house but after some real searching, council help and a couple of weeks we got a new house in place. 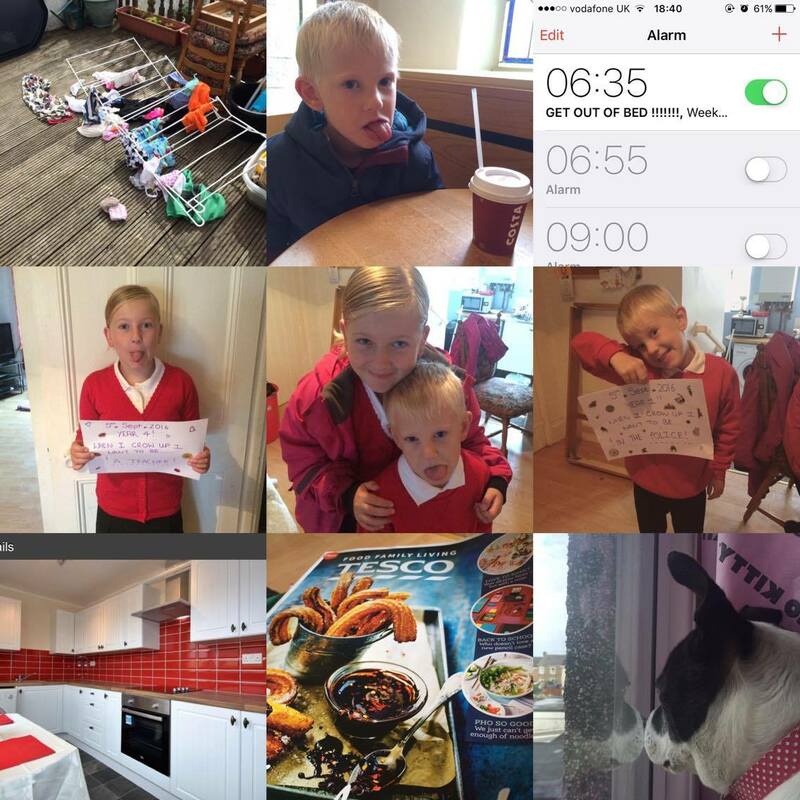 Before we knew it, it was back to school time which meant early alarms and saying goodbye to our lazy mornings! 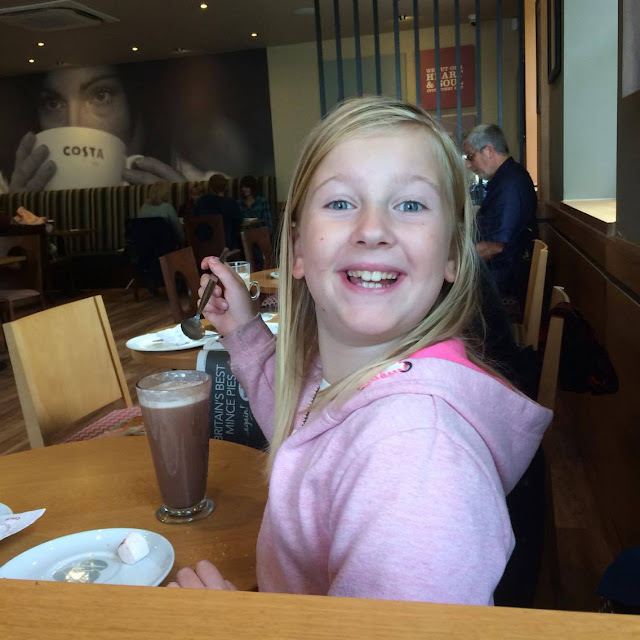 We had a yummy Costa a few days before we had to get back to our routine but the first day soon came around. Now I have a year 1 and a year 4, how can that be? My little ones posed in their uniform together and separately for our yearly back to school photo session in the dining room before we headed off. They have so far had a really good first term back. There have been plenty of things going on at school to keep us busy and I kept myself busy too with lots of packing and freecycling. The children enjoyed Roald Dahl day where I sent them in with their own dream jars I made myself. They also made some at school but mine were definitely better haha! I visited the pet shop, not to buy any animals don't worry, I just like looking at the hamsters and we met a cool parrot who even said 'see you later' to us as we left! The weather really took a turn for the worse in September, a lot of our roads became flooded, some businesses are still closed because they've had to totally refit their shops. 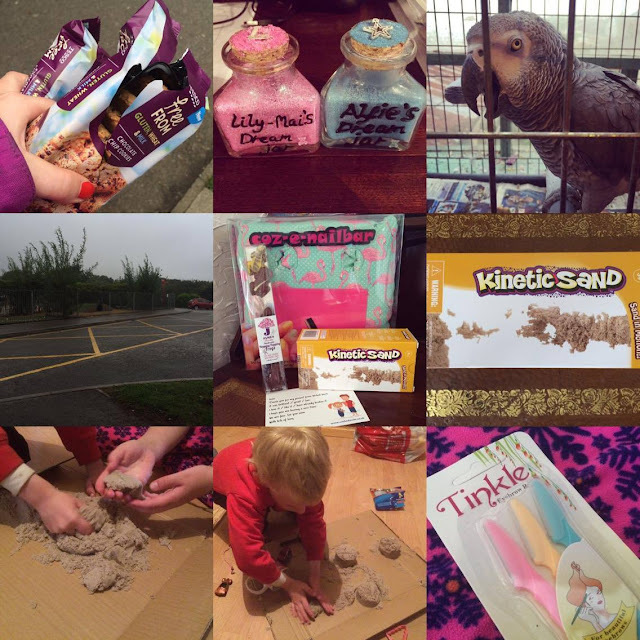 The Kinetic sand we received from my sister as part of our Wicked Uncle review was the perfect distraction from the rain and cold so we all spent hours on the floor of the dining room playing about. Cookie munchies//Dream jars for school//Cute parrot in the pet shop//Dull weather and plenty of rain on the school pick up!//Chocolate,sand and a nail varnish pillow from Wicked Uncle// Kinetic sand// Lots of playing about with our new sand//I got fed up of plucking so bought facial razors. Rubbish name but at least I can get rid of hair much quicker! I have spent a lot of time with some new friends I've made from Little A's class. It's so nice to chill out after the school run at Costa every now and then before heading home to housework and other jobs. I've tested Mustela's skincare range out on my families sensitive skin and we had fun trying our the different creams and using the bath milk! Little was really keen which was surprising given he usually hates creams! Oh yes, the new £5 notes came out. I was quite excited to get one actually although I'm not so keen on them and the novelty has worn off now! As September drew to a close we had boxes surrounding us and were all sleeping in one room so we could clear the attic room and store boxes from upstairs in Little A's room (no big deal considering he was mostly in with me anyway!) We got our moving in date at the end of September so I started changing addresses and doing all the boring stuff early which has paid off! Soon it'll be time for me to catch up on our October! It's going so fast this year but this is my favourite time with Halloween, my birthday and of course, Christmas! Sort out change of address and the energy suppliers- dull! - Without plant extracts derived from genetically modified plants (GMO). - Without ingredients derived from animal products - except hive products (honey, beeswax, etc.) -, purified lanolin-based products or milk-based products. - Without terpenes (camphor, menthol or eucalyptus). Skin Diagnosis. What skincare product is best for your family? We still have a small selection of those bubble baths and shower gels because well, the kids are right; they are cool and as nice as the bath milk is, it doesn't give the big bubbles a good squeeze of bubble bath does (especially my gorgeous chocolate orange bubble soak mmm) The bath milk is perfect for regular baths though and we use the novelty products on a weekend as they don't bother the children's skin either. The emollient cream has been amazing for Midge. She gets quite dry skin which she seems to have inherited from her Dad. A little goes a long way with this cream and because it isn't thick and doesn't have a strong or noticeable smell, Little A has even decided to start using it. 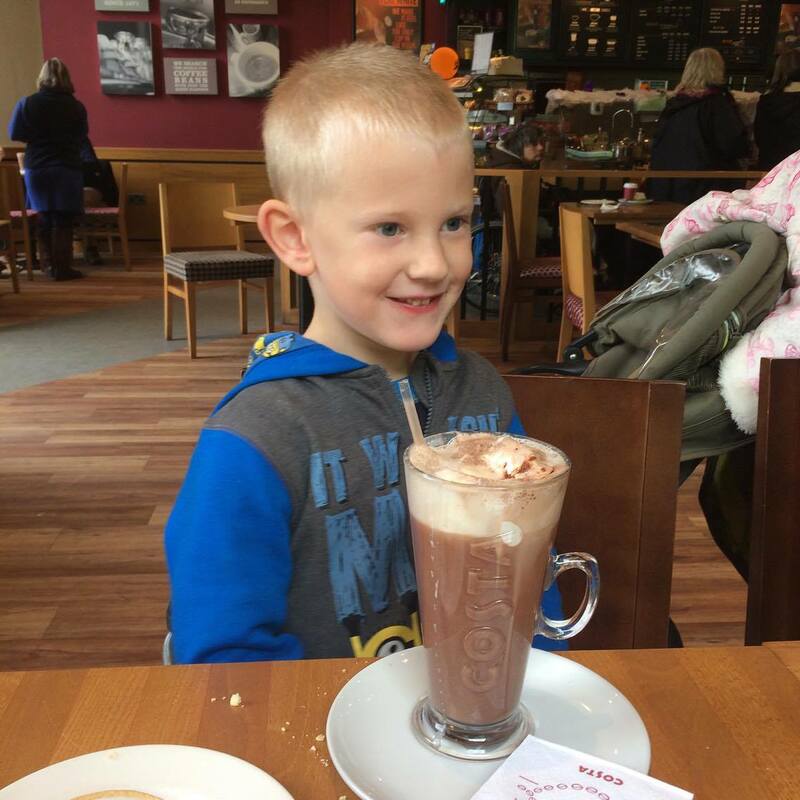 For those who don't know, Little A has sensory processing difficulties and one of the things he struggles with is having showers, using gels, creams and anything else (only coconut oil has been allowed anywhere near him which is great because it is so good for your skin, he likes it because he smells like a Bounty bar!!) We have been using the emollient cream on A, actually I should say he has been using the cream because he applies it to his face and arms all by himself and quite willingly too. I was a bit worried about the children putting it on their faces but they don't seem to have had any problems and as this product is aimed at very young children and babies I am pleased to see on my twos delicate skin the cream has caused no problems. Finally we tried the cleansing cream, well I tried it, the children were happy with the emollient cream and milky bath oil so I have been using this in the morning and at night on my face (again, I was concerned I may come up with some blotches because that usually happens with any cream I apply to my face as it's the most sensitive area) but I have had no problems at all. As part of my new healthy eating regime I have noticed my skin clearing up and needing a little extra help so using this cream has been a much better option than the harsher creams on sale in beauty stores I'd previously used or considered. I was sent these products for the purpose of this review and have found them to be of great use to my family or to myself and therefore would recommend them to others wanting a product for those with sensitive skin and especially the milky bath oil for those who have very young children and those concerned about the ingredients in supermarket bubble baths. I've looked online and found the Mustela range to be of good value for money given their size on Escentual but you can have a look at their list of online stores here. Alternatively, you can see if your nearest city has any local stores (sadly for us online is the only option which is a shame!) I haven't come across the range in any Superdrug or Boots stores unfortunately. I would like to purchase this multi-sensory bath foam for Little A, I think it would go down a treat! Mustela also do skincare products for expectant Mums too, so it's well worth a look! One month ago we got given our notice to leave the house I'm now spending my last night in. The children are finally sound asleep, I've just said goodnight to Mr B and had my last ever shower in the house I've actually grown to love and even call home despite its obvious short falls and need for care I can't quite give it. Little A was 2 years old when we arrived here, Midge was 5. That makes it feel even longer. I remember first seeing this place and being unsure because I always get anxious when moving, usually I'm paranoid about our future neighbours. We've become close to our neighbour who is sad to see us go which is nice considering I'd thought he'd be pleased to not hear my fish wife voice and the kids screaming and stamping! Apparently he's as gutted as us which is nice really. There are things I won't miss; like the open planned downstairs which I've never been a fan of in any house, the wallpapers and old carpet on the stairs but that's very little. I'll miss the amazing view from the attic window, the noise of the rain as I relax in my bed. I'll miss the children having their own space and the big back garden. Everything happened so fast with leaving this place. It's only now I spend my last night here reflecting on my home that I realise how much it meant to me. We had kind landlords, good neighbours, plenty of room, we could decorate and do whatever we liked and never had an inspection. This is all just ramblings. We will be happy and we will be okay. Inspections are normal and over and done with in minutes if you're being good tenants and there's no problems to report. I know all this, I guess I'm just a little sad tonight. Here Little A had his first big boy bed. Midge had her room decorated the way she's always wanted it and I'll never forget the look on her face. We've had some fab birthday parties. We'd put Santa footprints all over the laminate because it was easier to clean and the children loved it. We brought Peppa to live with us here and my 2 lovely hamsters are buried in the back garden. Midge used her money to buy a big trampoline which has seen a lot of fun but sadly has to be left behind. I've locked myself out on a number of occasions and had some fun trying to get back in over the gate covered in brambles and by sticking my arm through a cat flap to unlock the back door! We've lost first teeth, had many a wonderful BBQ out the back. We've had sensory break throughs, great games of hide and seek and so much more. They are the memories of Number 47 and now we must embrace and enjoy the new house...our new home for as long as we are lucky to call it that. 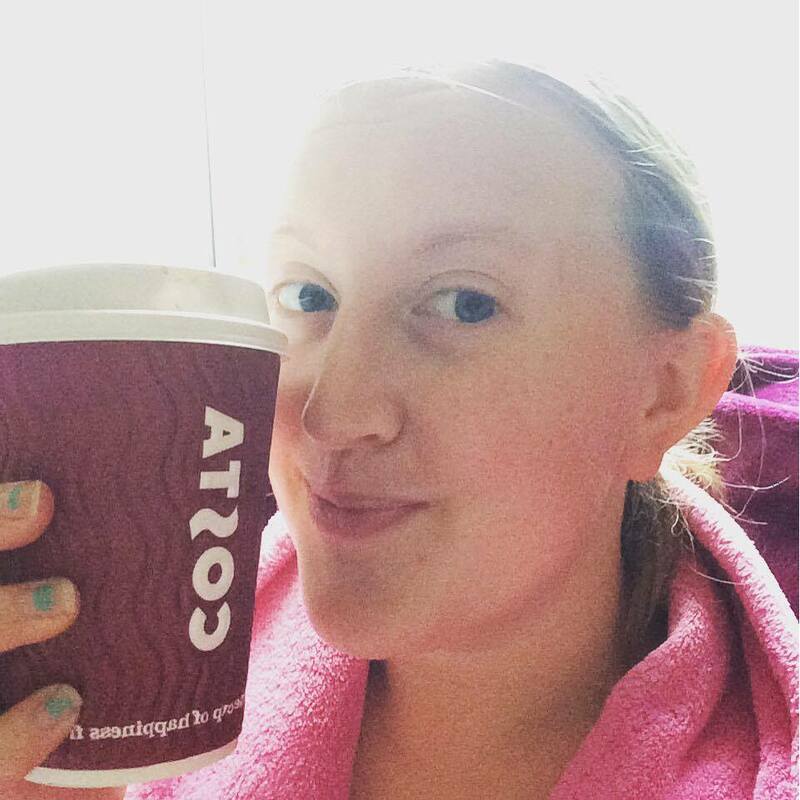 A Slimmer Me: Something has Clicked! I have been waiting for this day for so long. Many times I have forced myself to exercise, to be good with food and all the rest but because I was forcing myself it never lasted. The amazing body change photos on Instagram and the tighter jeans just didn't seem to make me want to get up and stick to any routine, I gave up time and time again. Until I visited my GP last week and got a metaphorical slap in the face. See, I thought I was suffering with constant bloating. I felt awful and looked horrible; I had been for months. Eventually I decided to get myself checked out, thought it might be my IBS and maybe I could be recommended something to soothe my troubled tummy that I hadn't already tried. Well, ladies and gentlemen I do not have a bloated tum, it's a rather soft and erm cuddly tum I suppose which means that yes, that's right, I'm overweight. I'm 3 stone heavier than I should ideally be and the way I view myself is as 'looking like I'm 4 months pregnant but not actually up the spout at all no thank you very much..' It's a perception and not a fact. Yep, I'm overweight and would appear to be carrying this weight mostly around my middle, I think this is a dangerous place to carry excess fat. And it is fat, I'm not saying I am fat but I am stating the obvious here. I am unhealthy and I need to change. I feel good. Despite the stressful situation that is mostly being on my own with Mr B working a lot this week, parenting, school running, housework-ing, packing, being a mum, friend and wife I have had amazing food days so far. 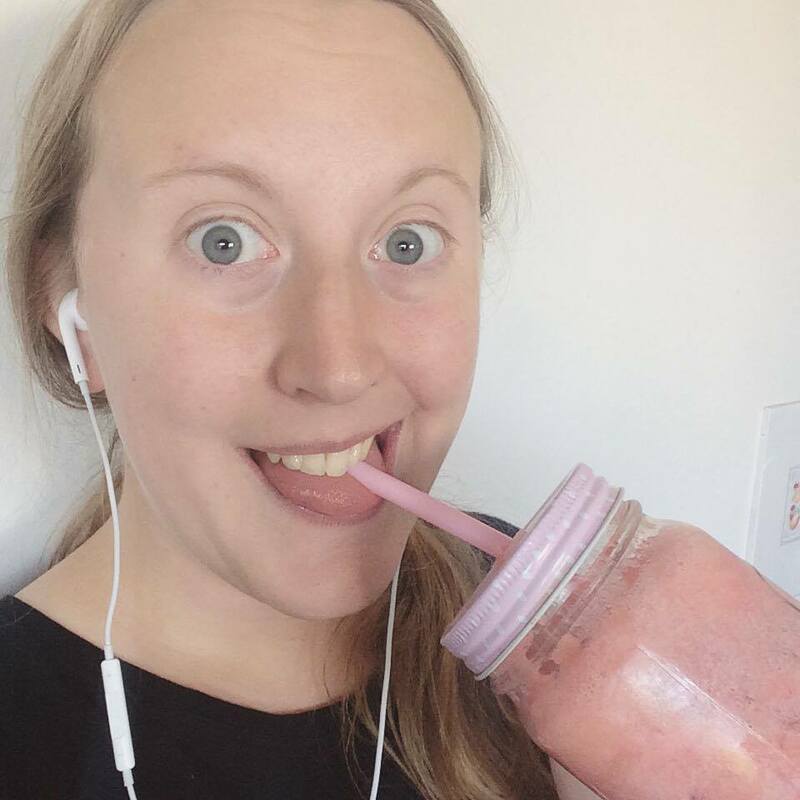 My breakfasts are breakfasts I can't wait to make, I'm so looking forward to getting into my new kitchen and baking vegan treats (I'm not vegan I just want to try out cakes with some new ingredients) and I have an exercise routine in place for when the house is unpacked and I have space to do it. In the meantime I have school walks, dog walks and swimming so I'm not sat on my backside all of the time! I had to record this moment here because it feels like a milestone, like I've turned a corner with my relationship with food and how I feel about myself. I hope anyone else struggling can relate to how hard it is to get going and I wish you luck on your journey to a healthier you; whether that's losing weight, gaining weight or making a lifestyle change which is pretty much what I feel I'm aiming for. It's Japan and the year is 1853. Growing up among the samurai of the Satsuma Clan, in Japan's deep south, the fiery, beautiful and headstrong Okatsu has - like all the clan's women - been encouraged to be bold, taught to wield the halberd, and to ride a horse. Sounds good doesn't it? I can tell you it is, in fact, a very good book and absolutely worth a read. I often read books that I can't put down, especially historical novels because they're my favourites but it isn't often that as I read I can picture the scene in my head perfectly. From scenery to characters and even their clothing, Lesley helps paint a perfect picture in this beautiful yet dangerous novel. I have never before read any Lesley Downer books but I will definitely be looking at reading more. I usually read books based in the Tudor era and therefore Japanese history has never been on my radar. Since reading this book I have been online and the history is incredible, it's little wonder my brother is so into Japan and knows a fair amount about it. Lesley doesn't just research and write but she has lived in Japan, she knows Japan and her books are well based and looked into which is really important to me. Overall this book is a real 10/10 for me and I shall be passing it on to my brother to see what he thinks as well as recommending it to my book worm friends! 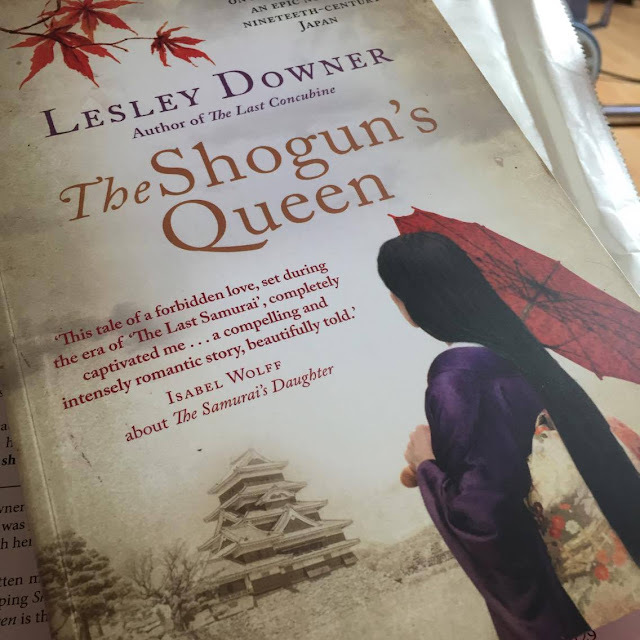 I was kindly supplied with a copy of The Shogun's Queen to read for the purposes of this review. I really enjoyed delving into Atsu's world while my own is so chaotic at the moment! The Shogun's Queen will be released on November 3rd 2016 and will make a fab present for Christmas for any historical novel fans!